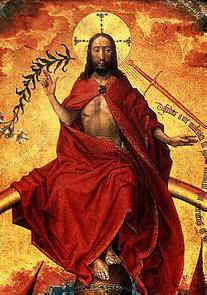 When Christ returns there will be a reign of a thousand years peace. Those who return back to him will be granted a pardon and release. Those who have broken hearts and depression will enjoy health for evermore. No person again will ever be shunned by society or ignored. Pride and envy will no longer be in control. Never again will love be cold. Love will shine, evil will fold. Like a marriage it will not be brought asunder. The Church waits the consummation of peace for evermore. These were part of 9 wooden panels.